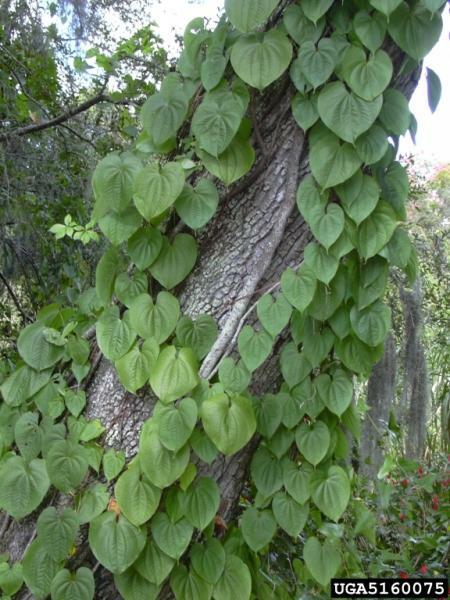 Dioscorea bulbifera is a highly invasive plant and presents a management problem in many parts of the world. Despite some medicinal and agricultural uses, D. bulbifera is widely characterized as an organism that outcompetes and smothers native vegetation. Dioscorea bulbifera is a monocotyledonus, dioecious, herbaceous perennial vine. Its annual stems, which arise from tubers, twine counterclockwise (Schultz, 1992). Langeland (undated) writes that \"stems are round or slightly angled in cross section...[and] leaves are long petioled [with] blades to 8 in or more long.\" D. bulbifera has simple, alternate, obvate leaves, characterized by their distinct heart shape and veined pattern. Aerial tubers, or bulbils, arise from the axils of the plant and are usually smooth and subspherical. D. bulbifera is identifiable especially by its aggressively climbing, twining stems, which reaching lengths of 60 feet or more, and its \"large heart shaped leaves...and potato like aerial tubers from the leaf stems\" (Schultz, 1992). In an analysis of 4 wild Nepalese yam species, including Dioscorea bulbifera, Bahndari and Kawabata (2004) found that constituent chemicals in the yams \"tend to imply that…wild yams may present a health hazard potential, which in turn demands propor processing before consumption to eliminate the effects of the antinutrients.\" Another study, by Beck et al (1984), evaluated traditional preparation methods of wild yams by Australian aboriginals. The process of baking, slicing, and leaching the yams overnight in running water removed the bitter compound diosbulbin D, making the yams palatable. Plant microfossil analysis from the Me' Aure' Cave in Moindou, New Caldaonia, and the Yuku rock sheltor in Papua New Guinea suggests that D. bulbifera or a closely related precursor was present in these regions between 2700-18000 YBP (Horrockset al, 2007a;Horrockset al, 2007b). Morisawa (1999) writes that tubers and bulbers of Dioscorea bulbifera usually sprout during spring, using dead vegetation from the previous years' growth to gain access to the canopy. Bulbils, which can lie dormant for up to a year, are produced in mid-summer and drop to the ground in the late summer/early fall (Schultz, 1992). Stems begin to die back in the early fall. Morisawa (1999) notes that \"raccoons, wild hogs and other animals do not seem to feed upon the bulbils,\" a factor which contributes to D. bulbifera's rampant growth. 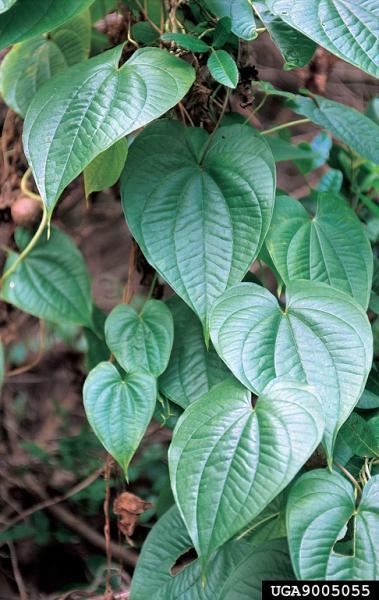 Schultz (1992) notes that \"Dioscorea bulbifera is one of the most common and widespread food yams and can be found in every hot, humid tropical region of the world.\" D. bulbifera is high in diosgenin, and is collected in the wild for steroidal drug hormones. Chemicals derived from D. bulbifera are also used in contraceptive pills. (University of Wisconsin-Madison, 1999). Dioscorea bulbiferademonstrates aggressive growth in a variety of mesic habitats, especially thickets, disturbed areas, fence rows, and hardwood hammocks. D. bulbifera does not inhabit coastal areas due to its salt intolerance, and it is rarely found in pinelands (Morisawa, 1999). In tropical hammocks, D. bulbifera's growth is most concentrated in canopy gaps (Shultz, 1992). Dioscorea bulbifera is vegetatively propagated. By producing an abundance of bulbils (aerial tubers) in its leaf axils, D. bulbifera assures its continuation, especially since soil contact is not necessary for stem production (Morisawa, 1999). 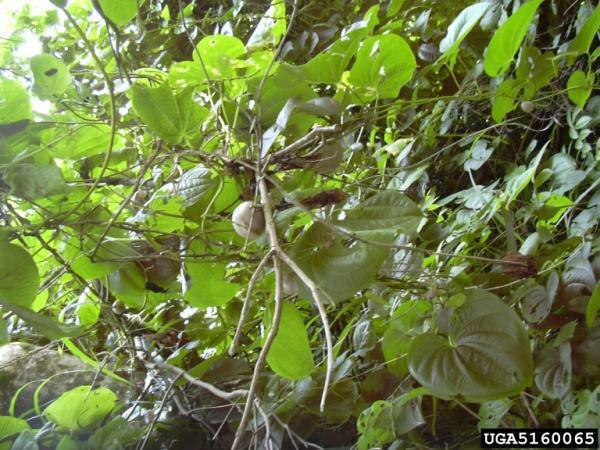 Recommended citation: Global Invasive Species Database (2019) Species profile: Dioscorea bulbifera. Downloaded from http://www.iucngisd.org/gisd/species.php?sc=1220 on 22-04-2019. 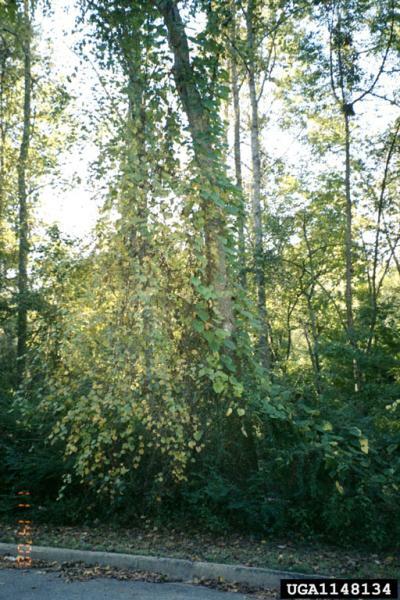 As an invasive plant, Dioscorea bulbifera has a variety of negative impacts. D. bulbifera interrupts natural ecosystem function by forming a mat of vines impenetrable by other plants or sunlight. D. bulbifera can smother both seedlings as well as full grown trees (Shultz, 1992) D. bulbifera also impacts wildlife species dependant on native vegetation. Economically, extra taxes and fees sometimes must be levied to help pay for control and eradication efforts. (Invasive.org, 2002). Management of Dioscorea bulbifera is generally labor intensive, expensive, and requires multiple visits to control sites. Horvitz and Koop (2001) participated in a study which investigated the relationship between native and non-native vine behaviour in the Miami-Dade area. Their intensive control program for D. bulbifera included: pruning native vines for better access to non-natives; cutting non-native vines; hand application of herbicide to non-native vines; hand pulling non-native seedlings/tubers; and positioning and pruning native species to facilitate growth and canopy access. Sites were revisited within 6 months for recutting, reapplication of herbicides, and \"hand removal of seedlings or other regenerative organs\" (Horvitz and Koop, 2001). Horvitz and Koop (2001) note that \"management significantly reduced seedling recruitment by non-native vines.\" Other researchers cite similar active management techniques for D. bulbifera, whose bulbils/tuber system is notoriously difficult to eradicate. Shultz (1992) notes the importance of disposing removed plant material in a secure location to avoid re-germination. Preventative measures: D. bulbifera should not be recommended as an ornamental plant. It is classified as a Class A Noxious Weed in Alabama and as a noxious weed in Florida (NRCS, 2007). Chemical: Morisawa (1999) writes that \"RoundUp, a nonselective herbicide, will kill the vines but the tuber will most likely resprout...Garlon 4 applied at a 10% concentration provides good control when applied with the basal application method. Completely encircle the lowest 30-61cm of the stem or trunk with the herbicide and form a band at least 15cm wide. Garlon 4 (10% concentration) and Garlon 3A (50% concentration) provide excellent control when applied to a cut surface.\" Wound vines with a hatchet and apply herbicide during the growing season (Morisawa, 1999). Biological: An ongoing study by Sambura and Pemberton (ARS, 2007) seeks to identify natural insect herbivores of D. bulbifera in Nepal. So far the researchers' have identified a possible biological control agent in the Nepalese air potato beetle, Liliocerus spp. Informations on Dioscorea bulbifera has been recorded for the following locations. Click on the name for additional informations. Summary: This source provides information on possible biological control agents for D. bulbifera. Horvitz, C. and Koop, A., 2001. Removal of Nonnative Vines and Post-Hurricane Recruitment in Tropical Hardwood Forests of Florida. Biotropica. Summary: This article details a exhaustive management scheme for removal of non-native vines in Florida. It encompasses mechanical and chemical control methods. Summary: Provides detailed list of impacts of invasive species, including D. bulbifera. Also provides identification clues and a summary of management techniques. Available from: http://www.invasive.org/library/FLFSNoxWeeds/airpotato.html [Accessed 15 May 2007]. Summary: This website provides a basic physical description and management techniques as well as an exhaustive list of alternate taxonomic and common names. Langeland, K., Undated. 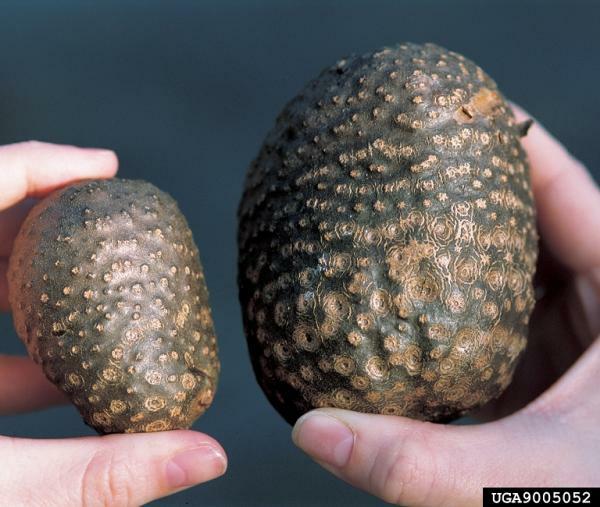 Natural Area Weeds: Air Potato (Dioscorea bulbifera). UF/IFAS. Summary: Detailed account of species physical appearance and habits in Florida habitats. Provides some management information and Florida distribution. Space, J., Flynn, T. 2000. 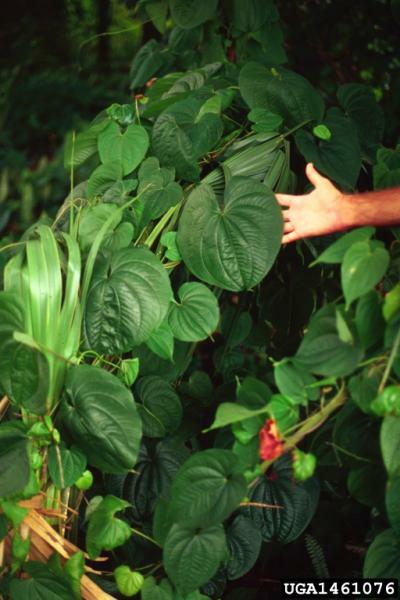 Report to the Government of Niue on Invasive Plant Species of Environmental Concern. USDA, Pacific Southwest Research Station. Summary: This paper provides management information for Pacific Island locations as well as distribution information. Available from: http://www.hear.org/alienspeciesinhawaii/articles/pier/pier_niue_report.pdf [Accessed on 16 May 2007]. Bhandari M.R. Kawabata J., 2004. Assessment of antinutritional factors and bioavailability of calcium and zinc in wild yam (Dioscorea spp.) tubers of Nepal. Food Chemistry. 2004. Summary: This article provides information on possible toxins present in D. bulbifera . Summary: This article provides information pertaining to the native distribution of D. bulbifera. Horrocks, M; J. Grant-Mackie and E, Matisoo-Smith, 2007. Introduced taro (Colocasia esculenta) and yams (Dioscorea spp.) in Podtanean (2700�1800 years BP) deposits from M� Aur� Cave (WMD007), Moindou, New Caledonia Journal of Archaeological Science. 2007. Summary: This article presents a plant microfossil analysis of remnants found in the Me Aure Cave. Summary: Detailed taxonomic information and useful links to other sites. An online database that provides taxonomic information, common names, synonyms and geographical jurisdiction of a species. In addition links are provided to retrieve biological records and collection information from the Global Biodiversity Information Facility (GBIF) Data Portal and bioscience articles from BioOne journals. Morisawa, TunyaLee. Weed Notes: Dioscorea bulbifera, D. alata, D. sansibarensis. The Nature Conservancy. September 1999. Summary: Detailed physical description of Dioscorea bulbifera and two closely related species, D. alata and D. sansibarensis. Also provides management information and impacts. Summary: This database provides information about the species including distribution, noxious weed classifications, taxonomy, as well as links to related sites. Summary: This site provides extensive information about D. bulbifera s habitat, ecology, distribution, and common names. Schultz, Gary. Elemenet Stewardship Abstract for Dioscorea bulbifera The Nature Conservancy, Arlington, Virginia. 1992. Summary: Detailed account of species physical appearance and habits. Also contains detailed management information for North America. Summary: Provides a brief description of D. bulbifera as well as medicinal uses of the plant. Summary: Information for species including common names, distribution, uses. Summary: This article examines the preparation techniques used by Australian aboriginals to ready D. bulbifera for consumption.